The Fukushima Women Against Nukes is a network of women that started in September 2012, using various direct actions such as sit-ins, demonstrations as well as petitioning to demand justice for everything that the Fukushima disaster has taken away from them. Earlier, in December last year, during Japanese Prime Minister Shiozo Abe's visit to India, the two countries had a broad agreement for cooperation in civil nuclear energy, but decided to go ahead with the final deal after solving “certain technical and legal issues”. The statement comes amidst continued political resistance in Japan to go ahead with a nuclear deal with India, citing the disaster at the Fukushima Nuclear Power Plant, initiated initiated primarily by the tsunami following the Tōhoku earthquake on March 11, 2011. Immediately after the earthquake, the active reactors automatically shut down their sustained fission reactions. However, the tsunami destroyed the emergency generators cooling the reactors, causing reactor 4 to overheat from the decay heat from the fuel rods. The insufficient cooling led to three nuclear meltdowns and the release of radioactive material beginning on March 12. Several hydrogen-air chemical explosions occurred between March 12 and March 15. Later, on July 5, 2012, the Fukushima Nuclear Accident Independent Investigation Commission (NAIIC) found that the causes of the accident had been foreseeable, and that the plant operator, Tokyo Electric Power Company (TEPCO), had failed to meet basic safety requirements such as risk assessment, preparing for containing collateral damage, and developing evacuation plans. The Fukushima disaster is the largest nuclear disaster since the 1986 Chernobyl disaster in Ukraine and the second disaster to be given the Level 7 event classification of the International Nuclear Event Scale. “After you have seen the reality of Fukushima, then we urge you to think carefully about the nuclear cooperation agreement. 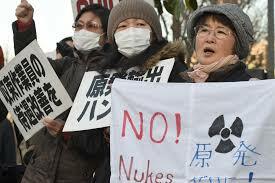 Nuclear power plants will not bring happiness to your citizens. We who experienced the injury of the nuclear accident, we came to understand this through our own bodies and lives”, the statement says.